I'm down to the last few apples. Their bright red and green skins are a little tough and yellowed now, their insides softer and supple. I've been eating and cooking with them for months, from the first ones plucked from the tree when they were just ripe to my main harvest. Since the harvest (and my last apple post) I've made a batch of apple and sultana chutney, a big oaty crumble with a bramley, roasted chunks to eat with sausages and grated several of them into porridge. I had one more thing I wanted to try before the end of the season: apple fritters. This recipe is based on one from Juls' Kitchen, the blog of a lovely Italian lady - one of the few bloggers I've had the pleasure to meet. I swapped the extra virgin olive oil for brown butter (can't help myself) and used sparkling water instead of lager (the sparkle makes the batter lighter & I wanted it to be non-alcoholic). They only take about fifteen minutes - perfect for when you're hungry, drenched with cold rain from biking home and your kitchen is nearly dark at 2:30pm. I'd never eaten an apple fritter before. The first thing that hits you is the granular sugar (provoking instant doughnut-recognition-alert-alert-this-must-be-good), then hot crispy coating and tender, perfectly cooked apple. It was love at first bite. They're delightfully messy, a treat to be eaten in the kitchen with your fingers, friends crowded round to get the next one out of the oil. Why have I not been making them for years? In a small pan, brown the butter (see here for extra instructions). Pour into a bowl to cool a little. Beat the egg in a shallow bowl, then add the flour, sparkling water and sea salt and whisk until smooth. Whisk in the warm brown butter and leave to sit while you prepare the apples. It should be thick enough to get a thin coating that stays on the apple. 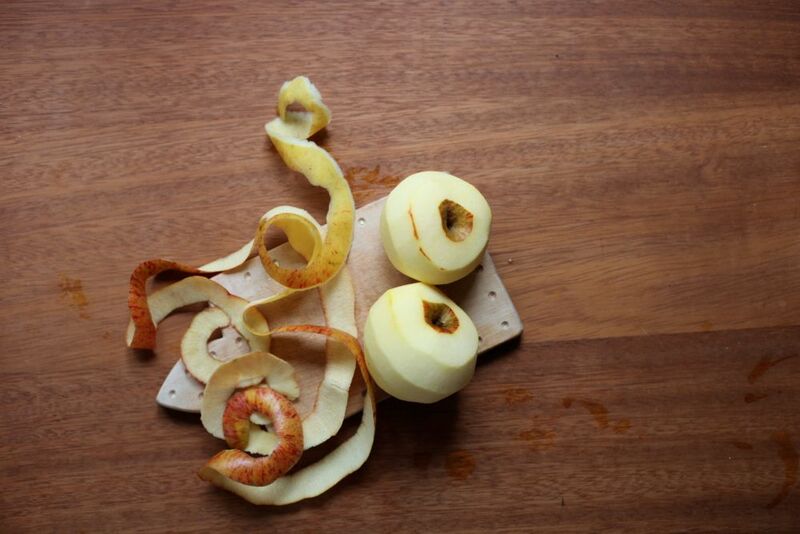 Peel the apples then use a corer to take out the centre. Cut into 1cm thick slices, being careful not to break the circles. 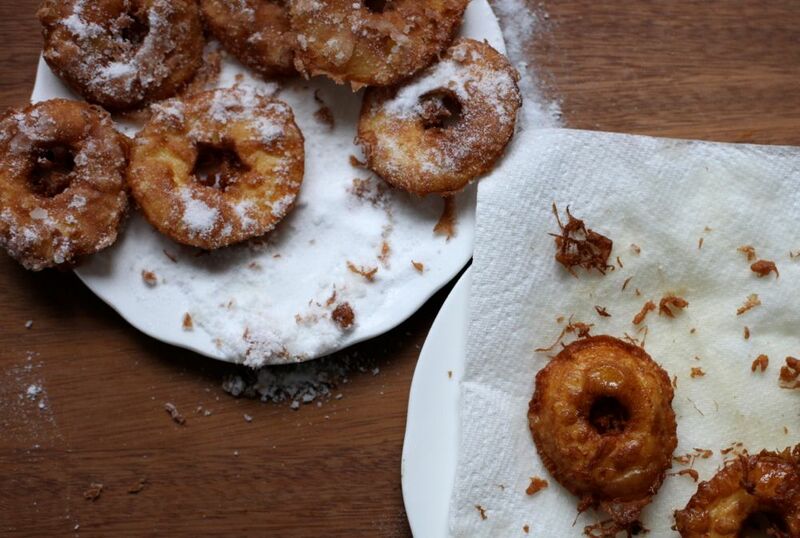 Prepare two plates: one with kitchen roll and another with a layer of caster sugar. Pour about 2cm of oil into a heavy-bottomed pan and heat over medium-high until shimmering and just starting to smoke. When you think it's ready, let a drip of batter fall into the oil - it should sizzle enthusiastically and turn brown fairly quickly. Dip a slice into the batter, making sure it's fully covered, then place carefully in the oil (use a slotted spoon or a couple of forks and lower it in - you don't want to splash oil that hot). It should sizzle and bubble away. Turn over when the sides of the slice are a deep golden brown then remove when both flat sides are done. Transfer to the kitchen roll plate for a minute to soak up excess oil, then move to the sugar plate and toss/sprinkle until covered. Eat as quickly as possible. Repeat with the rest of the slices and batter - once you know the oil is the right temperature and have the method down, you can increase the number of slices according to the size of your pan. These do not keep, though I imagine the batter would be ok in the fridge for 24 hours (whisk again when you want to use it). 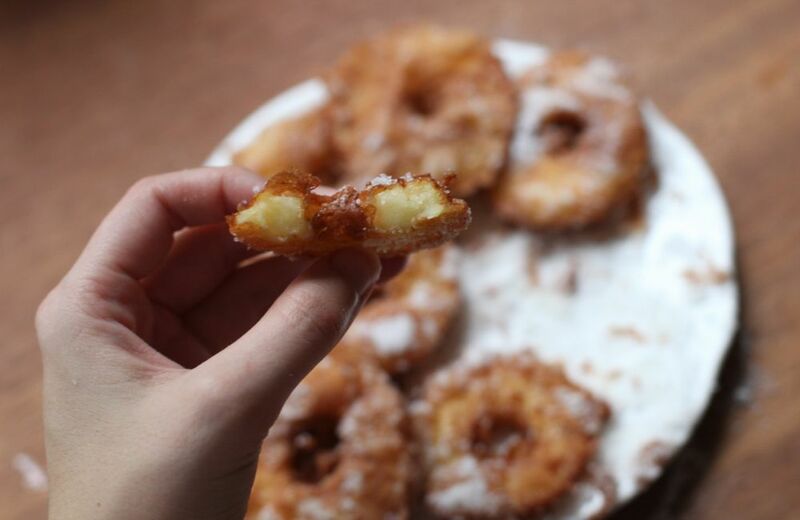 Oh man, I adore apple fritters. They remind me of cold toes and crunchy, gritty London snow and being in the market at Christmas time with my Jewish mum who hated Christmas but loved eating apple fritters with us. These look gorgeous. I'm not sure that I've ever had an apple fritter before either; this post has made me realise how much I'm missing out. Wow, taken to the brink of frying goldenness - yum! 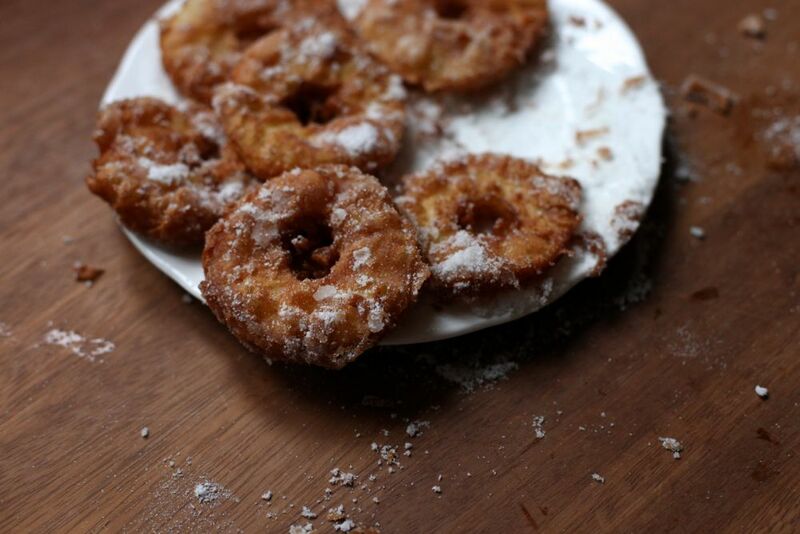 Doughnuts are exactly what came to mind when I saw that first photo - all that crunchy sugar and crispy batter around the edges of softened apple looks and sounds amazing. Much nicer than toffee apples which everyone seems to be obsessed with at this time of year but which I've never really liked! 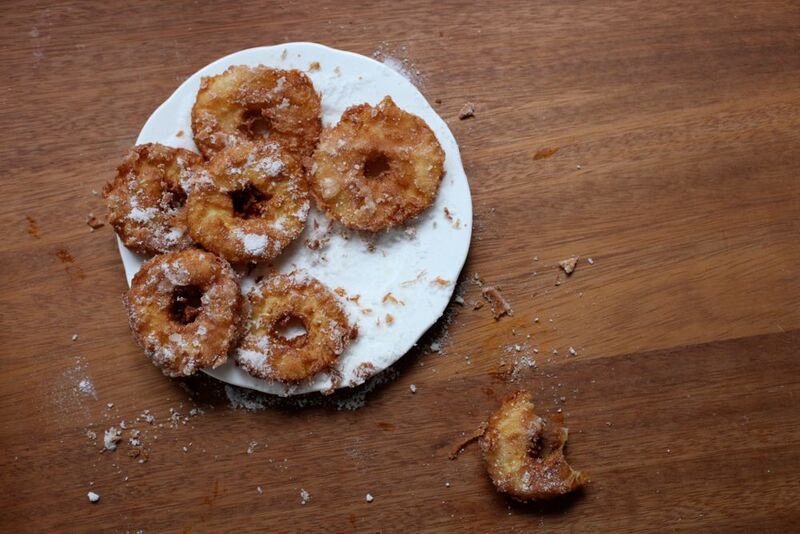 Just when I thought I'd exhausted all possible apple-based options..... along comes these lovely fritters. I think I'll try these with some California beauties. I can imagine it with some cold and crisp vanilla ice cream. These look *amazing*. This is my husband's favorite breakfast treat - his mom always made them for him growing up, and when we come to visit. But I've never made them for him! I should get on that. I'm going to have to try your version - I've never had them in rings, they look so much prettier than blobs of chopped apples. Yum! May Rosenthal - What an evocative little comment, I can just imagine it. Glad you like them! londonbakes - I couldn't quite imagine what they'd be like until I tasted one. Do try them! thecitygourmand - Heh well I don't like it when fried stuff is pasty and they need to be in long enough to cook the apple through, so I kept going until they were nicely golden - the top photo is probably the most accurate representation of the colour. thelittleloaf - They're the perfect doughnut-apple combination! I do like toffee apples as long as they're not the rock-solid-bright-red type, but these are better. 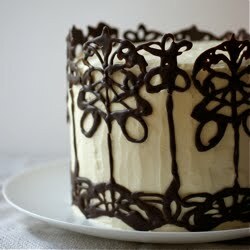 vanilla bean blog - I hadn't thought of having them for breakfast! I like the ring effect, too - especially as it makes them look even more like doughnuts.